Joel Salatin is one of the most prominent and prolific writers and lecturers in the organic farming movement and his farm - Polyface Farms - is frequently featured as a model farm within the organic farming community. His farm in Virginia is an organic mixed-farm (multi-species/multi-crop), which is multi-generational and family-owned, with a local direct-marketing business model. In Salad Bar Beef, Joel provides a complete how-to-guide explaining how he manages his cattle and how they are integrated into his holistic farming production model. It's a well written book, full of "you-can-do-this-too!" enthusiasm and packed with tons of practical tips about everything from cow-calf to grass-finishing, composting, and marketing. Even if your production philosophies and marketing strategies are very different than his, it is a valuable book to read in order to get an insight into Joel's successful organic business model. From the Publisher: The salad bar beef production model offers hope to rural communities, to struggling row-crop farmers, and to frustrated beef eaters who do not want to encourage desertification, air and water pollution, environmental degradation and inhumane animal treatment. Because this is a program weighted toward creativity, management, entrepreneurism and observation, it breathes fresh air into farm economics. 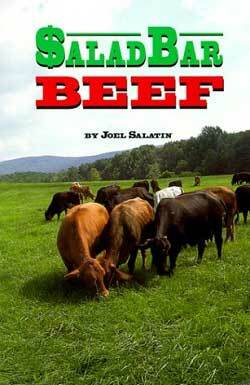 Have you read Salad Bar Beef? Share your review in the Comments section below!